Niagara Falls, NY - Niagara Falls City Forester Joe Urso keeps young Elijah Greenough, 13, on shore as he dumps a bucket of fish into Hyde Park Lake. The N.Y.S. 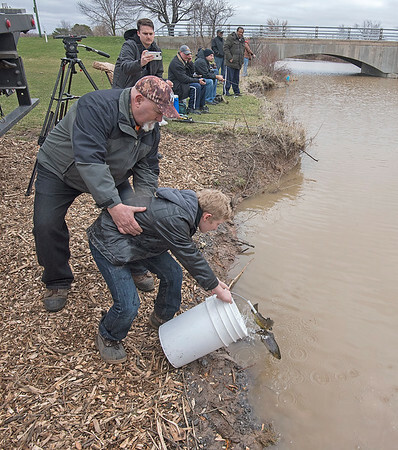 Fish Hatchery in Caledonia, NY., with help from the Niagara River Anglers Association, stocked Hyde Park lake with 1800 brown trout and Gill Creek with 540.